What an awesome weekend our team had! We attended the 2015 AAF ADDY Awards and did not leave empty-handed. 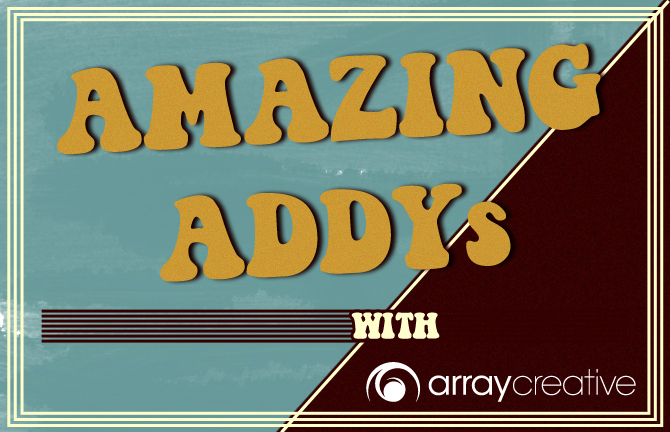 The ADDY’s is the world’s largest advertising competition, which honors creative excellence and cultivates the highest creative standards in the industry. Awards are given in 15 categories including sales promotion, collateral, direct marketing and interactive. So what did we take home? We were awarded two ADDY’s this year! We received a gold ADDY for our SWOPT packaging and a silver ADDY for our Nervous Dog Packaging. It’s a great validation for our always hard-working design team. This year the ADDY’s theme was the 1970s. AAF Akron went back to a simpler, more “funkadelic” time. We might be biased – but we looked DY-NO-MITE! The Awards were held in the beautiful Akron Civic Theater and top advertising professionals, students and other locals joined in for one fun evening! It was an awesome night filled with food, team bonding, and laughs. Our gold SWOPT packaging will be sent on to compete at the national level of the ADDY competition, so we’ll keep our fingers crossed for more accolades. Another great win for the agency – we’re already looking forward to next year’s awards. Thank you to AAF Akron, Todd Biss Photography and all the other sponsors!